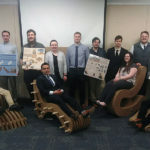 Architecture students from Penn State spent Friday in Penn College’s Construction Masonry Building as part of the university’s Masonry Design Competition. As a precursor to that activity – sponsored by the Pennsylvania Concrete Masonry Association and funded through a National Pennsylvania Concrete Masonry Association Foundation grant – the students are taught a variety of helpful masonry skills by Penn College construction majors. The annual visit, facilitated by faculty members Clifford J. Jones and Glenn R. Luse, coincided with a meeting of masonry instructors from Pennsylvania and Maryland. Students from Penn State’s landscape architecture program make a similar trip to campus each fall.